Most people like to eat peanuts especially in the winter time.But do you know that groundnuts (peanuts) seem as good as eating they are also very beneficial for our health,yes in the groundnuts many such elements are found that make a significant contribution in making our body healthy. Peanut is a very good source of protein and it is said that the amount of protein in groundnuts compared to milk and eggs is very high.If seen,as much nutritious elements as almonds are found in groundnut and it is also very cheap compared to almonds.Only a few granules of peanuts contain 428 calories,5 to 7 grams of carbohydrate,15 grams of protein and 35 grams of fat.Vitamin E,K and B6 are also found in abundance. To get these benefits it is advisable to eat about 20 to 30 granules of peanuts.Peanut is also considered as a good source of iron,niacin,folate,calcium and zinc. By eating peanuts, the body gets strength. The elements present in peanuts work to relieve many problems related to the stomach. Regular consumption of this reduce the problem of constipation and digestive system is strengthened. Peanut rich in omega 6 also keeps the skin soft and moist. Many people use peanut paste as a face-pack so that the skin can get its full benefits. Peanuts reduces the risk of heart diseases. There is sufficient amounts of calcium and vitamin D in it which build strong bones. 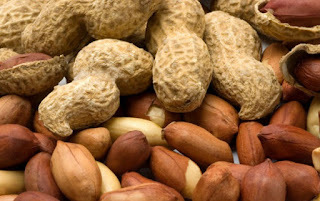 Adding groundnuts to your diet strengthens muscles and anemia is far away. Regular consumption of peanuts strengthens stomach and lungs. The people who have low iron in the body and less blood in their body due to this the body remains sick. But there is iron in groundnut which increase iron and blood in the body.